Two readers asked me about the slippers on previous post. 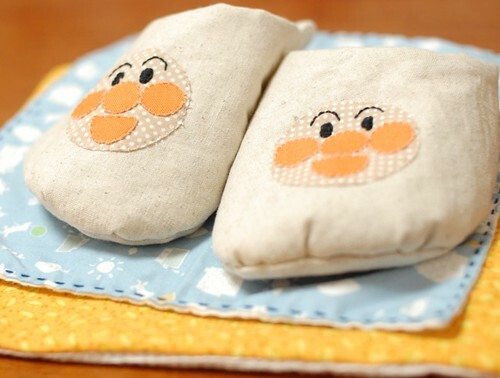 I made it with the pattern from a Japanese blog site. I asked her if I can introduce her recipe on my blog and she allowed it. You can download the pattern in the step 1. The pattern is for 6 inches long size. It fits my niece, 2 years old. Please seek the string "katagami_1.pdf" and "katagami_2.pdf" in the site. The patterns include approx. 0.5 inches allowance. A and B are the same pattern(for upper) and you also need the same pattern of batting. She used sock liners to put in the bottom. Instead of it, I put batting. In step 3, she sewed the upper. the colored pattern of the pictures mean the right side of the fabric. The bottom white one of the picture is batting. After sewed them together, turn it out. In step 4, you put the upper with the under(D) of the bottom. Every fabrics are right side up. and baste them together. In step 5, put the C on the 4, facing right side inside and sewed them together leaving a space to turn it out at the heel. In the step 6, turn it out and put a sock liner in it. In my case, I sewed the batting with C in step 5. That's all. It seems a little complicated but it's not so difficult. Please use many pins to sew it in good shape. Oh, I should tell you one more. Please don't sell the item with the pattern. She mentioned about it in her post. Some readers asked me if they could sell items with my patterns. It's OK. I don't mind how you use my patterns. One thing I want is you could enjoy them. This afternoon, my niece called me to tell "thank you". I'm happy to hear her voice (* v *). After my niece's call, I feel happy and made these little charms. 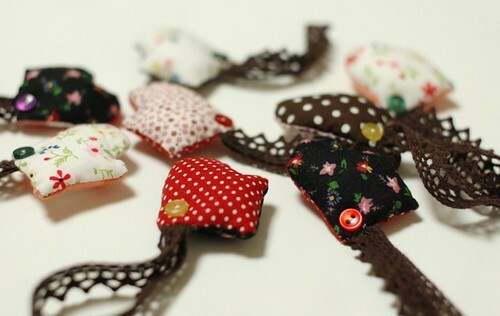 These are new petit gifts for my customers, mitten charms. You are so talented! I love all the pretty things you make. I am glad you are feeling better. I am happy for you and your husband and your little Tomato. :) Have a nice day. I love these little charms! Thank you so much for the instructions for the slippers! Your charms are beautiful! You must be feeling much better Mai. Yay!! These are so cute. Thanks for sharing! i love the small charms!! very pretty!! they make the perfect gifts! Sounds like it's baby-central in your family right now! :) These slippers are so cute. Btw, I'm doing a giveaway of one of your fabric book covers on my blog this week! I'm making one personalized for the winner. You and your readers are welcome to stop by! All of your items are so lovely, but I find myself covetint a mitten charm. You have a very creative mind. I'll always love your blog. Thank you for your lovely slippers also for the little gift. This actually is indeed Awesome expertise having writing and lots of due to yahoo search engine decide up me on here. I cherished studying your content and added to the ebook marks. The strategies you used to position up was clearly understandable. My husband also appreciated after studying this post. Let me undergo for more earlier. An intellectual work is performed once its structure and instrumentation are satisfactory to its creators and as it gets performed it can evolve and change. Thanks for the pattern. I wish I can do it. It look so cute. I'm doing a giveaway of one of your fabric book covers on my blog this week! Buy rain and winter boots a size or two bigger. Kids can wear heavier or even doubled socks. Most retailers won't restock boots, even if they sell out of a size, until the following year's season. Be aware that most rain boots don't come in wide sizes; you may have to go up in size to get them wide enough.